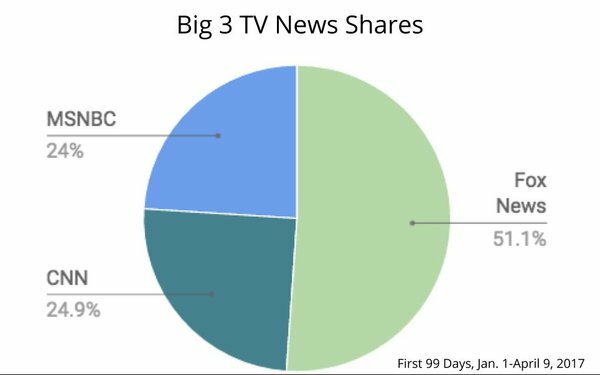 Analyzing the first 15-weeks of the year, Wall Street analyst Brian Wieser finds what appears to be a record volume of viewing of TV news. Using a metric, the Pivotal Research Group analyst calls “person-viewing hours,” he says the total volume of TV news consumed peaked at 44 billion hours, accounting for 12% of all national TV viewing. In a note sent to investors early this morning, Wieser said that represents a 21% annual growth vs. a decline of 1% for overall television viewing. Wieser did not comment on what was driving the record consumption, though it coincides with the start of the Trump Presidency. He did note, however, that news is playing an increasingly important role inside big media companies with news divisions.